Vector Rig stock images by Aurielaki. Infographic Oil illustrations in EPS10 EPS JPG AI. 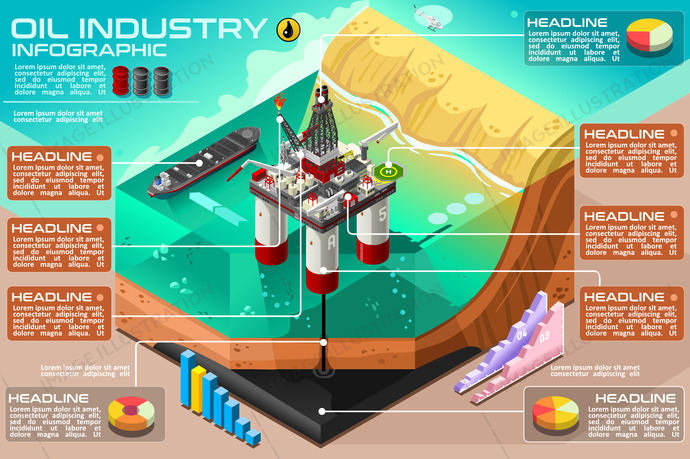 Oil industry and gasoline production business presentation vector infographic. Water oil rig drilling platform with helipad fuel tanker ship transported by sea. Offshore crude oil extraction. SKU: Vector-Rig-Oil-Infographic-AurielAki. Category: Energy Chain Set Vector 3D. Tags: barrel, business, cargo, communication, concept, crude, crude oil, data, derrick, design, diesel, distribution, drilling, energy, extraction, factory, flat, fuel, gasoline, helipad, icon, illustration, industry, infographic, information, offshore, oil, plant, platform, presentation, process, production, punp, rail, railway, refinery, rig, sea, ship, shipping, station, tank, tanker, technology, template, text, transportation, vector, water.